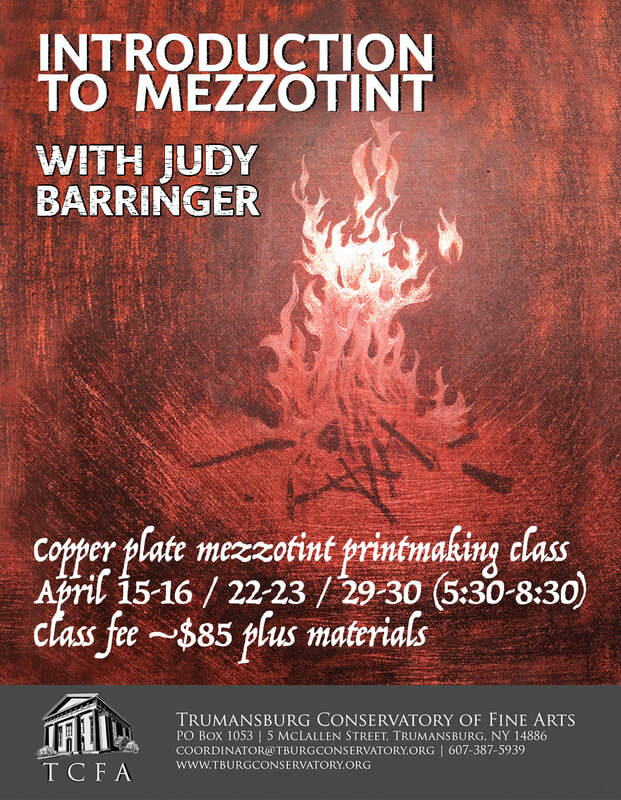 ADULT CLASSES - Spring offerings! Materials: $25 - all materials including one 4x6" rocked plate and additional copper if desired. Descriptive: Mezzotint, from Italian, mezzo-tinto for "half-tone" or “half-painted”, is technically a drypoint method in the intaglio family. Unlike etching, where acid is used to etch lines in the surface of the plate, thereby achieving the desired level of tonality, tonality is achieved by “distressing” the surface of a copper plate with thousands of little pits made by a metal tool with small teeth, called a "rocker." The entire surface of the plate is evenly roughened manually with the rocker. Tonality in the image is achieved by using tools such as burnishers and scrapers to smooth desired portions of the plate. It is similar to making a charcoal drawing and bringing out the highlights with an eraser. As in intaglio printing, the tiny pits in the plate hold the ink when the face of the plate is wiped clean. Areas smoothed with the burnisher and/or scraper will not hold ink and will print "white," that is, without ink. A richness in the print can be achieved by varying the degree of smoothing, creating varying tones between black and white. In these six sessions artists will have the opportunity to rock a plate, create the 'drawing' by burnishing and scraping the plate to create the mid-tones between black and white, and pull a couple prints from the plate. Provided supplies will include a copper plate, ink, paper, and the necessary tools for rocking and burnishing the plates. 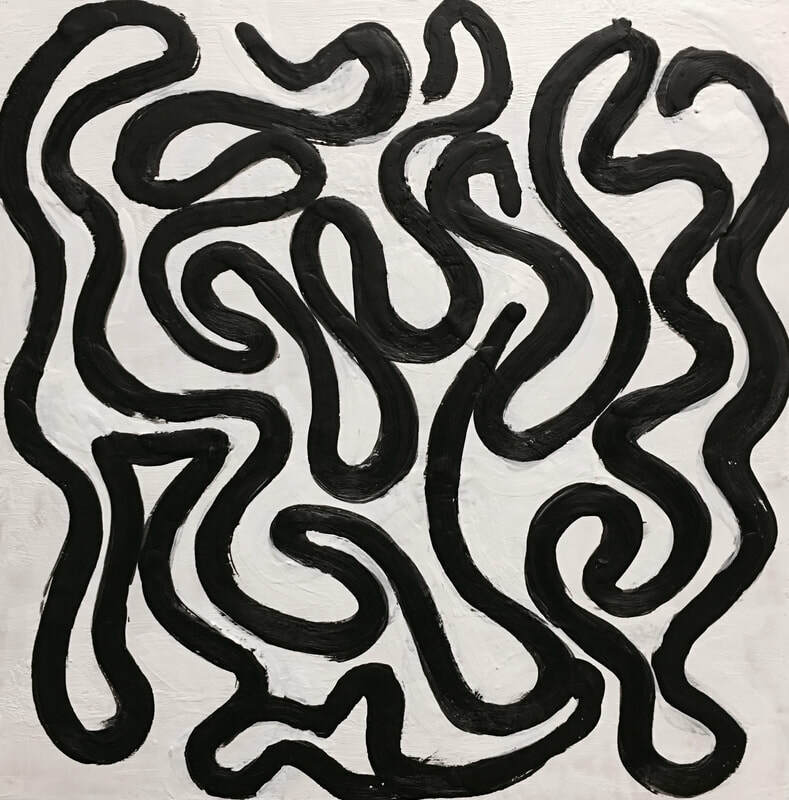 We are delighted to announce that the Cayuga Arts Collective is now offering Sunday Open Studio for painting (oil, acrylic, watercolor), drawing (pencil, charcoal, ink), and printmaking* with all materials included by appointment. You do not have to be a CayAC member to participate. There is no instruction but a T.A. will always be available and we will provide a still life for creative inspiration. Additionally, if you are interested in attending Open Studio on a regular basis we can provide designated shelf space so that you don't have to lug artwork etc. back and forth. Time: 1-3:30pm. Please email us at cayac@tburgconservatory.org by the Friday before and we will email you back to confirm. Suggested Cost: $10/hr ($9/hr for members) with materials included or bring your own materials for a flat rate of $10. ​*Printmaking available only to individuals who have taken a printmaking course or workshop at TCFA. 6-hr one-on-one tutorials are available at additional cost. Course Description: This exploration in color mixing aims to empower artists by giving them an organized way to think about mixing paint. No particular skill or understanding is needed to engage in this fun workshop. We will employ carefully the language of color and a palette of ten hues to create a useful take-home reference chart. Description: Learn basic wet felting methods using raw wool and other fibers such as silk, yarn, and netting. Participants will learn how to make these fibers bind together using water, soap and friction. Textural effects, along with other aesthetic techniques, will be covered. Each student can expect to bring home a 16 x 20” felted artwork to embellish later with stitching, beading and other found objects. Bookbinding - Monday Eves Nov. 12, 19 & Dec. 3, 10 Register for one, two, or all three classes! Open studio on December 10th for $10! Course Description: In this workshop we will talk about how to gear up and organize to best use your time outside. We will cover my approach to finding a subject, the compositional sketch, and blocking in a painting. There will be a brief demo indoors followed by approximately two hours of guided painting time outside. ​For information on Kari Ganoung Ruiz visit her website. Description: Inspired by a weekend workshop conducted last Spring to high school students, this year we are offering an extended version for adults. The class will cover both painting and wood block printing in monochrome. First we will create abstract or representational images in oil paint, then we will transfer those images graphically into woodcut. All levels of experience are welcome. yarn, and netting. Participants will learn how to make these fibers bind together using water, soap and friction. Textural effects, along with other aesthetic techniques, will be covered. ​stitching, beading and other found objects.